Most Connemara families had a work-horse in the past, a beast of burden that they took for granted. Only in the early 20th century were Connemara ponies recognised for their exceptional qualities. Hardy, companionable, resilient yet pliant, they are found exclusively in this harsh terrain. Their origin is uncertain. Probably they were a crossbreed of a native Celtic horse and Spanish-Arabs imported from Galicia in north-western Spain in the Middle Ages. Their qualities derive also from the particular combination of climate and terrain and the rigorous genetic selection that such an environment demands. 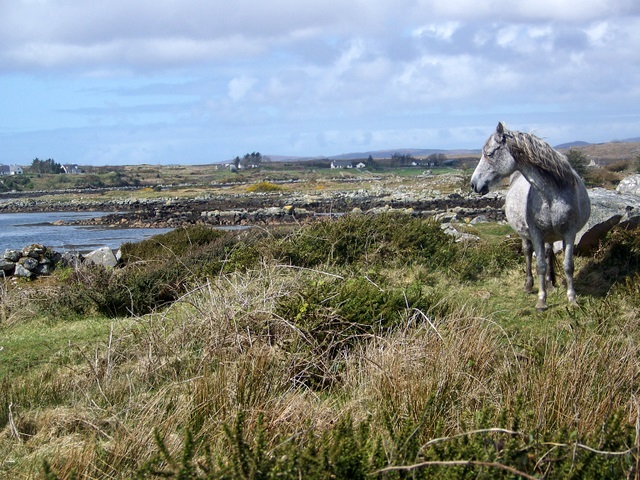 Pasture in Connemara is scarce and the ponies eat very little of it. Instead they feed on the salt-tolerant grasses and seaweeds on the seashore. In spite of their study frame, the ponies are naturally elegant and have become popular everywhere for riding and showjumping. © Copyright Maigheach-gheal and licensed for reuse under this Creative Commons Licence. This page has been viewed about 448 times.